I thought it would be helpful to project leaders, mappers, & other interested parties to provide links to all in development community projects in one easy to find spot. I'm sure that this isn't all of them out there, so if you are a project leader or you just know about an ongoing community project please provide me a link to the project thread & I'll add it to this post with a short description. It doesn't have to be a Doomworld exclusive project either as I'm sure community projects pop up over on ZDoom forums & elsewhere as well. Once a project is finalized I will remove it from this post. Also this thread is for community project that anyone can join, so no links to invitation community projects such as BTSX E3 or Elementalism will be provided. In Development projects looking for maps & other resources. A community project that is a throwback to such megawads as Memento Mori and Alien Vendetta. The project goal here is to make a 6 map wad with the theme of an old, rusting, tech environment. A community project making maps for Doom 64 EX. 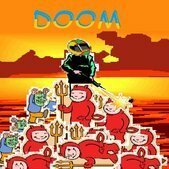 Make an episode 2 replacement for Ultimate Doom. Use Doom 3 textures & take the best gameplay elements of both Doom 3 & Doom 2 to create something fresh and familiar. A community project focused solely around the Icon of Sin! A whole thirty-two level map set, each with their own variation on Doom II's infamous final boss. The direct sequel to the 2013 megawad, Interception. Keeping in line with the last project, this wad will be a Doom II community project open for anyone -- mappers, musicians, and other artists alike -- to contribute content to until it has 32 levels, 32 music tracks to go along with them, and then some. A community project to get as many EE compatible maps together by December 31, 2019 and then compile them into an episode. A community project that aims to explore people's thoughts and views on death and dying. This is the third instalment of the NOVA series of maps, in which newer and perhaps lesser-known mappers get together to create a fully fleshed out megawad with help from the wider community. Ever generated a map with Oblige that, with some human modification, could become a fine-tuned well-paced quality map? This community project sets out to create a 32 map boom-compatible megawad out of procedural-manual synergy. The project goal is to get any amount of polished zdoom/GZDoom maps before January 1, 2020.﻿ They can be of any theme, difficulty, etc﻿. A vanilla compatible megawad that serves as an unofficial community sequel to Perdition's Gate, the megawad that was created by veteran mapper Tom Mustaine & friends that was at one time slotted to be a 3rd megawad included in Final Doom. Riding on the coat-tails of the last two MIDI Packs, this project, like them, seeks for the community's finest musos to compose a megawad's worth of original MIDI music for 2003 megawad The Rebirth by Björn Ostmann, aka Vader. A sequel to Switcheroom. Goal is to recreate the original id maps in a different thematic style. Make a set of levels that resembles the buildings as depicted on the intermission screen. The aim for this community project is to make a map which represents the original name of the Ultimate Doom map you have chosen to interpret. Yakfak has provided a new music pack and a resource pack, let's make maps to go with them! In Development projects that need some helpful feedback before final release. A community project where all maps are limited to 1000 lines﻿. A 32in24 speedmapping session started in order to kickstart the 3-Way CTF Game Mode. A Community Megawad, but each map is one continuous room containing at least 150 Hell Knights, and 1 Megasphere. Doom 2 maps that are reminiscent of various maps from Inferno, serving as a sort of sequel to Inferno. SlaughterMAX - Doom 2, Boom, MegawadThis community project is meant to spread the joy of making and playing slaughter maps. The idea of this community project is that every participant is limited to 4 wall textures and 4 floor textures. A community sequel to TNT: Evilution. On Hiatus projects, sometimes life & other factors can get in the way of Doom. These projects will continue sometime later. The latest installment in The Way ID Did series, this project will look to create two 32-level PWADs based on TNT: Evilution and The Plutonia Experiment. A collection of all maps rejected from both TNT: Revilution & TNT: Devilution. Project is on hiatus until the release of TNT: Devilution. Great idea! Will this be a running list? "4800 Hell Knights" is in the Testing Phase. There are no more maps being accepted to it. It will also eventually get a new name sometime prior to release. While there are 11 MIDI tracks in "Zekhmet," @yakfak seems to be open to the possibility of having more than 11 maps, if there are 11 maps that are odd/quirky/unique enough to fit the general theme. Doom 2 maps that are reminiscent of various maps from Inferno, serving as a sort of sequel to Inferno. (@bonnie could probably provide a better 1 sentence description) A fourth alpha is due out soon. Some of the projects are in Hiatus, such as Final Doom the Way ID Did. So it's good to put it out next to the name of the project. Waw, that is something I was looking for. Nice to see all running projects grouped. May I suggest to make 3 classifications (running, in hiatus and finished) and to put then in separate lists. Thus not removing the finished projects for easy reference. I will update this list whenever I notice a new community project start up, when major updates happen (cancellations, ready for testing, ect. ), & when they finish. I'll also be sure to keep this list of the first page fairly often, otherwise this list is kinda pointless as it would get lost deep in the depths of Doomworld just like some of these projects. Is TNT Convilution that much deader than Devilution? Just wondering because it always makes me sad to think how much the Plutonia PWADs outnumber the TNT PWADs. No it's not dead, I just forgot to put it on the list. I will not be posting any thread for the project until after TNT: Devilution is up on ID Games. I'm not a leader of this project which are 99% done, but I've submitted two maps for it. It's really needs more attention and someone who can help with testing and wad compiling. The project leader seems not interested in this anymore and appeared on Doomworld rarely. 32 maps of dead simple are what everyone wants and needs, right?